"Infinitely more important than the answers are the questions." The resplendent, luxurious surface of this artwork, richly embellished with gold, is pinned down with a dull, black dolour sign. What would make you feel ‘rich beyond measure’? Hand-dyed fabrics, hand-pieced, shibori-pleated, hand-quilted. A collage of my son’s baby-clothes, embroidered and embellished beyond all possible use; memories of precious moments in my Studio while my infant son slept. The spectrum of light is used to represent the life-force which flows through all animal and plant life. Hand-dyed fabrics, machine-pieced, hand-quilted and embellished. I interpreted the AQC Challenge “TEN” as 10 x 10 x 10, or a thousand patches of joyful colour; hand-dyed cottons and silks, machine-pieced, hand-quilted, embellished. The ‘aerial view’ of Country often utilised by an Indigenous Kimberley artists used here on a felted wool whole-cloth, with collaged fabrics and buttons to create intersecting roads, saltpans and bluffs. "In a dark time, the eye begins to see." ​Echoing my trip to Japan, the quilt evokes beautiful riverside Gion, in Kyoto, a pleasure-district (known as ’the floating world’) where geishas can be seen walking at dusk. Made with hand-dyed cottons and silks, machine-pieced, appliqued, machine and hand-quilted. By loosening the strings of the ‘Soul Bag’, the bright, shiny exteriors of our lives fall back, opening up the darker, more difficult aspects of our lives. However, allowing ourselves to look inside gives rich and varied treasure for the life journey. ​Quilt for a WATER-themed exhibition, based on memories of a Grade 6 Geography lesson on the Murray-Darling Artesian Basin so vital to eastern Australia; hand-dyed cottons, shibori, appliqué, machine-pieced and hand-quilted. 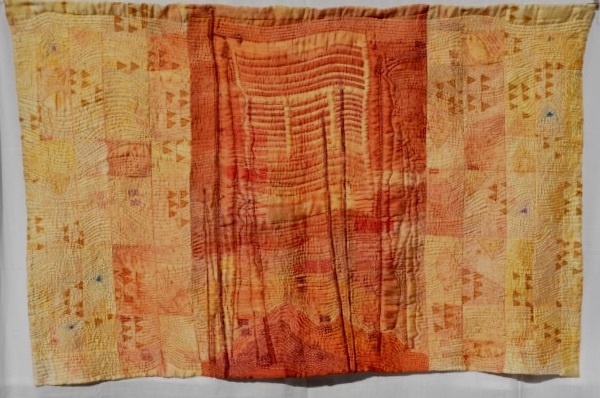 The discharged cotton Shibori panel was the starting point for this quilt, with surrounding stripes and grids resonating with its colours and textures of hand-dyed cottons, machine-pieced and hand-quilted. The Tree of Life is one of humanity’s central images of goodness, bounty and continuity.It is found in Jewish, Christian, Muslim and Hindu traditions, among others, and is sometimes known as the World Tree, joining the visible realm to the invisible realm. “Saltpan and Mulga” (2011), knitted form, wool, echoing colours used by Indigenous artists to portray Country. Life-sized mixed media/sculpture commissioned as a Guardian Figure for a country house. A hand-dyed cloth body, with garments, shoes, ceremonial head-dress, bags and ornaments. Made of textiles, leather, beads, bones, metal, wood, shells, bamboo wadding. "In the desert where no one comes, the sage sings a song of joy, in the voice of thunder." Winner of the Megan Terry Prize, Australian Quilters’ Association Biennial Quilt Exhibition, Melbourne, 2011. A journey to the Himalayas left memories of flapping flags, printed with Buddhist texts, shredded by the wind. The marks were not decipherable, but the intent was clear. Dye-printed silk-satin whole-of-cloth, machine-pieced, hand-quilted. COSMOS arose from reading Arnold Zable's novel, 'Sea of Many Returns', in which one character constantly struggles with the idea of the cosmos. not as something remote, but as a metaphor for each person's search for meaning. The jumble of colours at the centre represents the chaos of life, which is held, by the quiet blue of Infinity. ​Machine-pieced, hand-dyed fabrics, hand-quilted using thick threads to link the visual energy at the centre with the tranquil surrounds.